Food Truck based out of San Pedro, CA. El Burger Luchador was parked downstairs from my office. Since I was clearly meant to sample this burger, I obliged fate and ordered a burger. A standard cheeseburger with fries was $8.00. My meal was ready in about 7 minutes. The naming convention was used in the menu, but I wanted something a little more over the top. It seemed like a gimmick they could have had more fun with. The Beef: El Burger Luchador used 8 ounces of 80:20 Chuck to create the base for their burgers. The Chuck was beefy and juicy. It was not complex, but it was relatively satisfying. Judging by the flat sides and nearly perfect roundness of the patties, I guessed that the patties came pre-formed from the meat supplier. The Seasoning: My burger patty was well-seasoned with a blend of salt and pepper. I noted a dusting of Cotija cheese (sort of a Mexican Parmesan), and this added a hint of iron to the burger. The Sear: What sear? 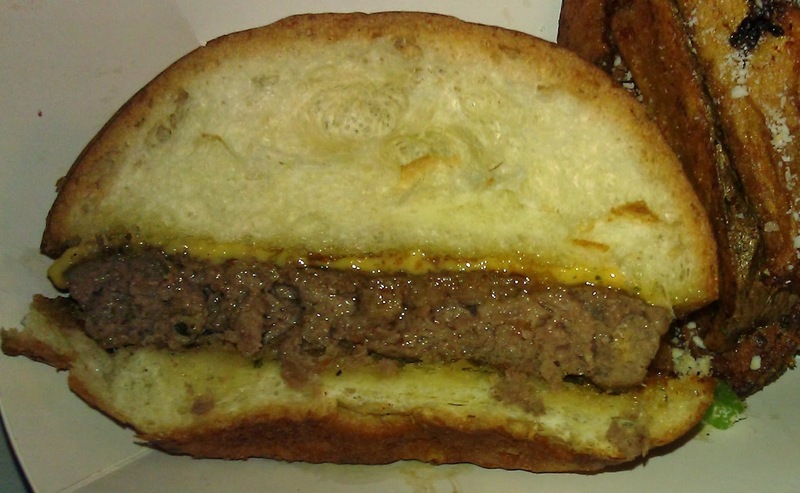 Either the burger was steamed on a too cool griddle, or it had been precooked. Either way, the sear was non-existent. This was a case where a hearty sear would have truly made this burger pop. The Preparation: The burger patty was completely cooked through to Well-Done. It was a juicy and beefy Well-Done with no hint of chewiness. 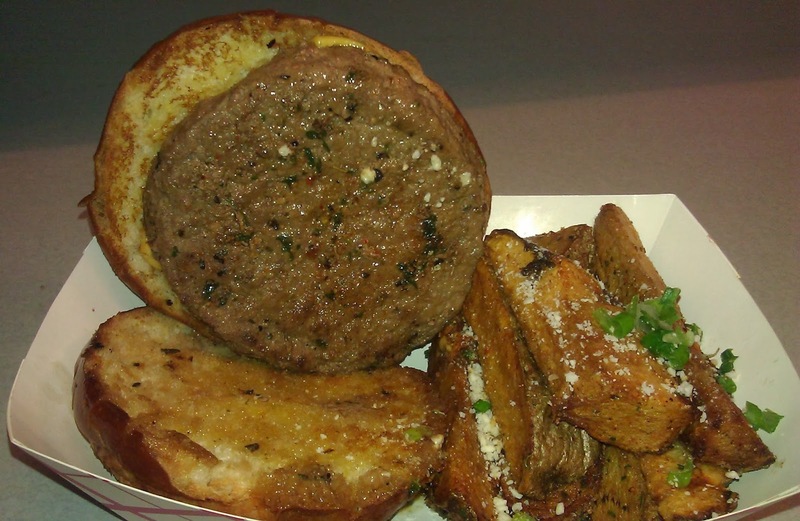 The beef was ground at a medium setting and cooked on a too cool, gas-fired, flat-top griddle. The Cheese: El Burger Luchador topped my cheeseburger with a slice of American cheese. The cheese was well-melted, but there was not enough of it to stand up to the thick Brioche bun. The cheese faded into the scenery and was as notable and memorable as a background dancer. Remember K Fed's work? Exactly. The Bun: The bun was a thick, fresh, moist, sweet Brioche. The skin was on the leathery side, but otherwise the bun was fine. It was not toasted to a meaningful degree, so the bun added no crispness to the burger. The Fries: El Burger Luchador provided peel-on wedges. The potato wedges were crisp, nicely browned, well-seasoned, and boasted creamy centers. The Value: 8 bucks for a full meal was average. I ate half of my cheeseburger and took the rest home to Happy Meal. 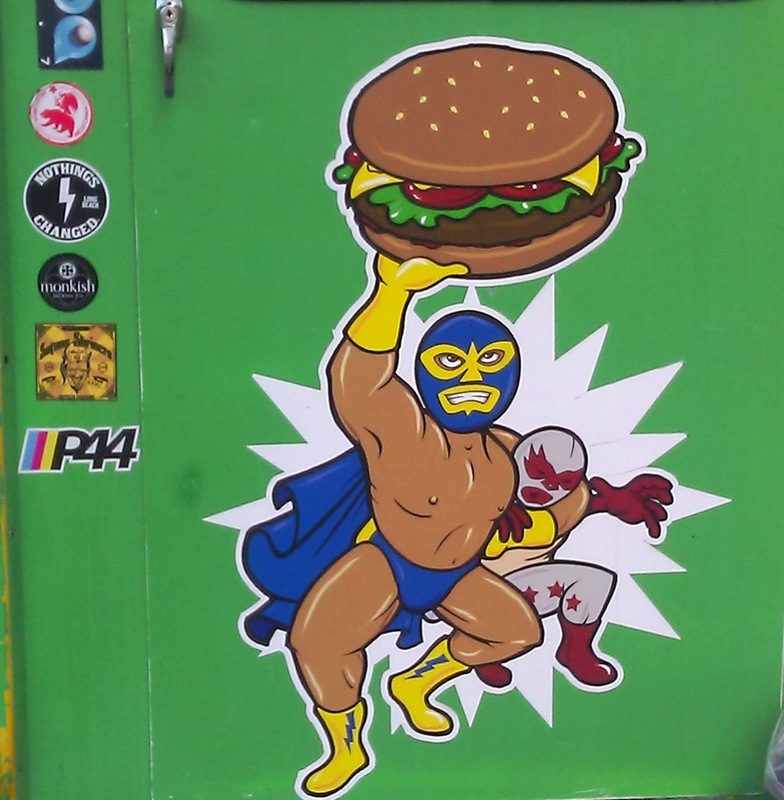 I wouldn't go out of my way tracking down the El Burger Luchador truck, but I wouldn't flip them off in traffic. El Burger Luchador prepared an average burger at an average price, and this was just fine. 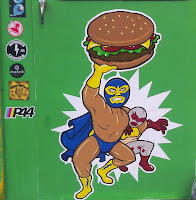 Burger Review : That'll do, El Burger Luchador, that'll do.